We've included listings for companies such as Signature Hardware and Rustica Hardware inside our Locksets guide. More than one thousand pieces of brass, iron and hardwood reproduction cabinet and furniture hardware is always in stock and ready to ship from this Connecticut manufacturer. Individual to bulk orders accommodated. 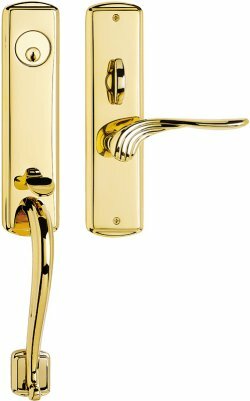 Manufacturer of door locks and hardware, including knobs, levers, handlesets, and a line of keyless entry sets. Makers of handcrafted wooden screen doors - incoluding beautiful Craftsman and Victorian series - that can also be converted to storm doors. Also offering screen door hardware, including hinges, door closures, locksets, handles, or pulls. Three partners with a long history in the building trades industry formed this company, Millwork for Less, to sell and distribute wooden entry doors and millwork. Classic door latches for board-and-batten doors. A thumblatch entry set with a contemporary feel.